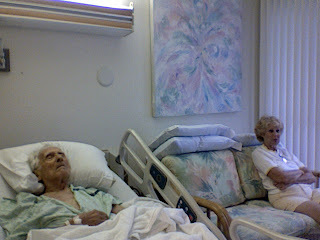 Below are the pictures that Robin asked me to snap of Grandpa's hospice room. (click on them and they should get bigger). It's quite lovely, with some furniture, a private bathroom and a sliding glass door and patio should it ever, ever, ever stop raining. Don't be fooled by the lighting in the pic of Dad and Mom by the window - there is no sun here. It's all baking Vegas at the moment, from what I hear. And yet in a heartbeat I'd take 116 over this thick swampy air that follows you into the deepest recesses of every building. To give all of you a sense of what you're missing: This has been a very strange, confusing several days. 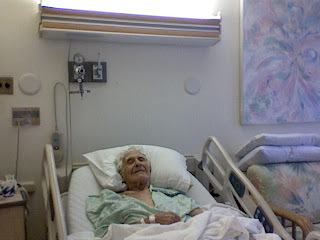 Grandpa's body is clearly not ready to give up even if his spirit is broken, even if e's largely uncommunicative and, even if the morphine is only barely relieving his discomfort. There's a reason this man made it to 93 and managed to come back strong from a broken hip at 88; he's a fighter and an ox. So it's a confusing experience because Dad, Robin and Susan want to abide by his wishes for minimal medical intervention and would like his pain and discomfort to be brief even if that means death, and yet who wants to root for death? Worse, who wants to have to wonder if they made decisions that caused a premature death, even if they're perfectly reasonable decisions and they follow his wishes? Yes, Grandpa's picture was bleaker and bleaker... and then suddenly it became a bit sunnier -- but only comparatively and certainly no day at the beach. He's still in pain, he still has an nonfunctioning bladder, he still has a very weak heart, he's still only able to have small bits of pudding and water, he still howls rather specific nonsense -- "Get your foot off my foot!" and "Put me down! Put me down!" are two of today's. That said, there are also moments of incredible, heartwarming clarity. Grandpa moaned and yelped as they moved him onto the stretcher and then rolled him through the rain to the ambulance. But once inside the vehicle, he settled and suddenly looked in my face, burst into an enormous grin and said, "I love you." And then God knows where he went. OK - past bedtime. These days of nothingness are, somehow, awfully eventful in their own odd way. And, also, this experience has me feeling closer to Grandma than I've felt since the months after her death. I'm not sure how that makes sense, but I do feel that way, perhaps because of the significance of the moment, the similar experience of idle hospital time filled by our family's irrepressible humor and powers of observation, the sense that this is the true close not just of Grandpa's story but also Grandma's. He has mentioned her more than once, albeit when I've asked him questions about his life in an attempt to get him to talk a little. Once he's gone, the world of 226-22 76th Road in Bayside will really, truly be gone. Gotta get to bed. These were taken with the built-in cam in my laptop. 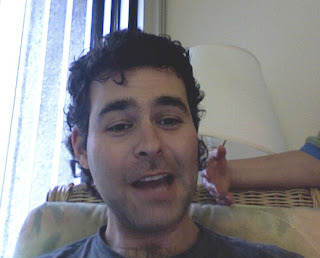 The bottom shot was posted for Miles' benefit, since he was intrigued by how the humidity and the fact that I've not had a haircut since May has affected my Jewfro. All images taken on March 28, 2007 by Steve Friess. The shot of the feet is of me. Click on any of these and a full high-res version will appear.